BOEGBOR, Liberia, May 29 2013 (IPS) - Sackie Qwemie works for Equatorial Palm Oil, the company that took his land in northwestern Liberia. 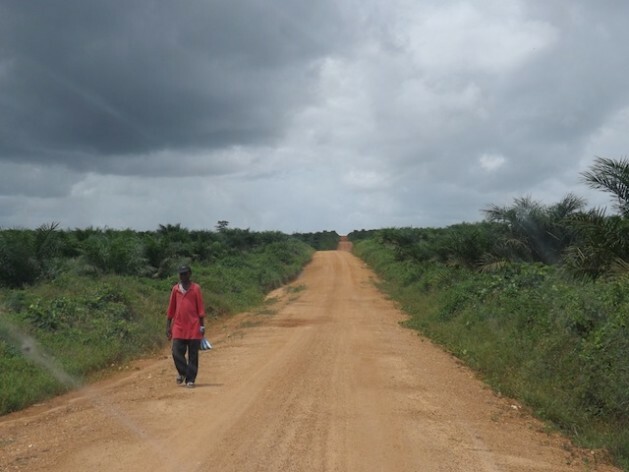 He has been working on the EPO plantation for three years because the land that he once farmed was given away in a lease to the concession company based in Grand Bassa County, one of this West African country’s 15 political subdivisions. His job is not a pleasant one, there is a taste of bitterness, but working for the company that has his land is the only way for him to survive. “The people came, they destroyed our bush, our living. Even the creek, the water we drink – they damaged it.” -- Joe Bah, chief of Boegbor. The farmer, in his early 50s, is among the many villagers and community dwellers who have seen their land taken over by the company, and their crops bulldozed under. “In the place I used to make my garden they came and cleared my whole bitterballs (a small species of round eggplant), my whole pepper, cassava, everything was destroyed,” Qwemie tells IPS as he sits under a palava hut in Boegbor, a town in district four in Grand Bassa County. “I had the biggest farm here; I came from the hospital and heard the news that the machine had cleared my farm. Since then I’ve not been on my own farm.” Qwemie, however, does not know how much land he has lost. The farmer looks weary and angry as he lays out his case, accusing the Liberian government of giving up the land to the company and ignoring the interests of the people it serves. He says this move has created serious hardship for them, as the money paid by EPO is small and cannot meet their families’ needs. “Now before I eat pepper, I have to buy it. I don’t know what to say, I can’t fight this company because they say the government gave the land to the company,” says Qwemie. EPO took over the Palm Bay concession area, clearing 34,398 hectares of land for the development of oil palms. The 50-year concession was negotiated and enacted into law in 2011 with the planting of the first new oil palms. It began expansion into district four in Grand Bassa County not so long ago. This expansion has further upset the local community here, with many resisting any attempt at further expansion. “The people came, they destroyed our bush, our living. Even the creek, the water we drink – they damaged it,” says an angry Joe Bah, chief of Boegbor. Bah and his kinsmen maintain that they were not consulted in the leasing of their land to EPO. He says the company used bulldozers to clear the land, including ancestral land and sacred sites, without any remorse or respect for their local culture. “All this bush here – that was our cassava farm … the people have destroyed it, even our rubber trees. There is no place here for us to make a farm, (to grow food) for us to eat,” he tells IPS. Local people also accused the government of using the head of the National Traditional Council, chief Zanzan Kawar, the country’s most revered traditional elder, to scare them off from claiming their rights over the land. “When Kawar is present in any community, all the Zoe people in Grand Bassa County and elsewhere in all the other counties can be present,” says Isaac Gartaryon, president of the youth in the district. The Zoes are traditional high priests who are believed to have supernatural powers and are feared by locals. People dare not speak against them for fear of the consequences. “So they use that heavy influence … so nobody could talk,” he tells IPS. Citizens of the land who have vehemently opposed the expansion of the company have come under strong criticism from community elders who hold positions in government and are close associates of company officials, alleges Gartaryon. “The young people, the women and chiefs were not consulted (about the expansion), so we resisted. But the National Traditional Council still maintains its position and says that as far as they are concerned, the President of the Republic of Liberia has given this land to (EPO) … and anybody (who speaks out against it) will be arrested,” he says. But EPO maintains that the land it currently occupies is the land that it was leased in negotiations with the government in 2008. The company says it is currently only operating on 13,000 hectares of the land, and has not even occupied the full territory because of the resistance by the local community. With regard to allegations that the community was not consulted, Thomas Borshua Jr., senior accountant and administrator at EPO, said “I wouldn’t say that is true. We’ve had numerous meetings with the town chiefs, the surrounding villages and we’ve talked to them. “We are not interacting with people on an individual basis; they have their leaders that were presented to the company to speak on their behalf and those are the people the company dealt with,” he explains to IPS. Despite Borshua’s assertions that the company only occupies a portion of the land, tractors can be seen moving around the concession, and the sight of newly-felled trees in areas that villagers allege are not part of the company’s 34,000 hectares of land is commonplace. The local residents have vowed to fight on. “We will resist them in the bushes and we are very serious about that,” says an angry Gartaryon. Speaking in conversation with Reuters Insider on May 17, in the United States, Liberia’s President Ellen Johnson Sirleaf said the government was taking steps to address the current land crisis. “There’s no doubt about it, that once we say the communities have rights to what’s on their land. Even if we decide to negotiate concessions because they don’t have the resources to put the land to use, that in effect will benefit them with housing and jobs and social benefits but they will be full participants,” she had said. Rights organisations here, such as the Sustainable Development Institute (SDI) Liberia, which works to raise awareness and increase public participation in natural resources sectors, believe the government should go beyond mere words and do the right thing. “The issue of land in Liberia is more than just a legal issue; it is matter of livelihood especially for communities living in rural parts of the country,” Nora Bowier of SDI tells IPS.